We provide our customers unique business premises and renewing services in historic properties which we develop into lively city blocks. We are a Finnish property investment company, boldly different and responsible. Our locations are built for life. Our business operations are based on our strong client base and the demand for varied premises and services. Also the interest in taking historical properties into use again and developing them, utilising existing infrastructure and introducing renewable sources of energy are factors bringing us together with the customers and various decision-makers. Our customers are companies and organisations of different sizes and the public sector. Our customers’ business operations are facing various challenges and changes. We want to serve our customers in the changing business environment and guarantee them competitive premises in all situations. Our aim is to develop a customer and service-oriented operating model that invests in facilitating the customer’s needs for premises and related business essentials. For us, premises are much more than just square metres. We implement operating environments which provide services. We are present at our sites. We are part of a larger community: when we develop our properties, our role often expands into being a developer of entire blocks or city areas. This is simply due to the sites we own being traditional and large former production and factory areas around which cities were once built. Our properties are part of the existing urban infrastructure. Today, a community spirit is reflected in the everyday lives of our properties in many ways: our customers meet each other in co-working facilities, leisure and cultural premises or the cosy cafeterias and restaurants located in our premises. We connect and network customer companies in our properties. Our sites are located at central, easily accessible locations. Because we own properties in seven cities, we are also a nationally-attractive resource. We are a Finnish property developer, boldly different and responsible. This statement is based on the cornerstone of our business: we own several large former industrial properties around which city centres grew. We put these properties to new uses and develop them into lively city blocks in cooperation with different parties in the area. Our locations are built for life. When we develop properties for new uses, we comply with responsible principles that withstand both assessment and time. We take environmental values and the needs of society into account. In addition to cities and municipalities, we cooperate with various regional parties and organisations in our development work. Customers’ needs are the starting point for all of our operations, including property development. Our aim is to provide our customers with facility and concept solutions that meet their needs for premises in a developing urban environment. Our customers include both the private and public sector. Our largest development sites are currently the Asko area in Lahti, Porin Puuvilla city block in Pori and Tikkurilan Silkki city block in Vantaa. Our other development sites are the Finlayson district in Forssa and WSOYtalo building in Porvoo. Our total leasable floor area is approximately 312,000 square metres, and there is almost as much in unused building rights, 370,000 square metres. Our property base is a cross-section of the Finnish economy. In accordance with circular economics, we have put historically significant industrial environments back into use and developed them into lively city blocks. Resource wisdom is at the core of our operations. In the past, cities grew around our property locations. We are excited that we are able to bring these areas back to life in cooperation with cities and companies. We have jointly succeeded in modernising premises, properties and entire areas. We have also taken into use renewable forms of energy offered by the Finnish nature. We are jointly creating a sustainable city culture which will last for the next 100 years. Renor annually takes part in the Global Real Estate Sustainability Benchmark (GRESB) rating. In 2018, results were reported and evaluated for operations in 2017. We achieved three stars out of five and a Green Star designation. Our score improved by 5 points from last year. In total, GRESB globally assessed 903 real estate investment companies and property companies in 2018. Our results exceeded the averages for all participants, and we placed fifth among non-listed Nordic participants. We have continued increasing the amount of renewable energy used in our properties. As a result, we succeeded in reducing our portfolio’s CO2 emissions by approximately 30% in 2017 compared to 2016. Furthermore, we are committed to following the energy efficiency agreement for the property sector, which has been concluded between the property sector, the Ministry of Economic Affairs and Employment, the Ministry of the Environment and the Finnish Energy Authority for 2017–2025. Our extensive utilisation of renewable energy solutions reduces the environmental burden caused by our locations. We are experts in this respect. In the Asko area properties in Lahti, we produced 160,000 kWh of cooling from groundwater in 2016. The Asko area utilises renewable energy sources extensively: the groundwater system is used for cooling approximately 15,000 square metres of offices, restaurants and lobbies. The electricity consumption is approximately 30–50 per cent smaller compared to premises equipped with traditional cooling. This corresponds to the average consumption of electricity of approximately 13 single-family houses. The Askotalo building is BREEAM In-Use GOOD-certified with regard to both the building and technical maintenance. In spring 2017, one of Finland’s largest property-specific solar power plants was put in use in the shopping centre. Now, 2,226 solar panels produce approximately 534,000 kWh of solar power per year. This is equivalent to the annual electricity consumption of 266 apartments in a block of flats. The solar power plant also further reduces emissions by approximately 300 tonnes a year. Puuvilla is committed to using purchased electricity of which 50% is generated with wind power. In addition, Puuvilla extensively utilises geothermal energy, accounting for 98% of Puuvilla’s annual heating and cooling energy needs. The Puuvilla shopping centre has been awarded the Platinum LEED environmental certification. The Vanha Kutomo building in the Finlayson district in Forssa is BREEAM In-Use GOOD-certified with regard to both the building and maintenance. The result is excellent, considering that the building has more than 160 years of history. Renor’s aim is for Tikkurilan Silkki to be as environmentally friendly as possible. In fact, Silkki’s first phase will include the construction of a geothermal power plant. It will account for the entire block’s cooling and heating energy supply apart from the residential block of flats. The geothermal power plant will be completed around the turn of the year 2018–2019. The property will be LEED Gold certified in connection with the renovation. Silkki will utilise geothermal energy, similar to Lahti and Pori. Business development was stable in 2017. Net sales grew to EUR 24.8 million. 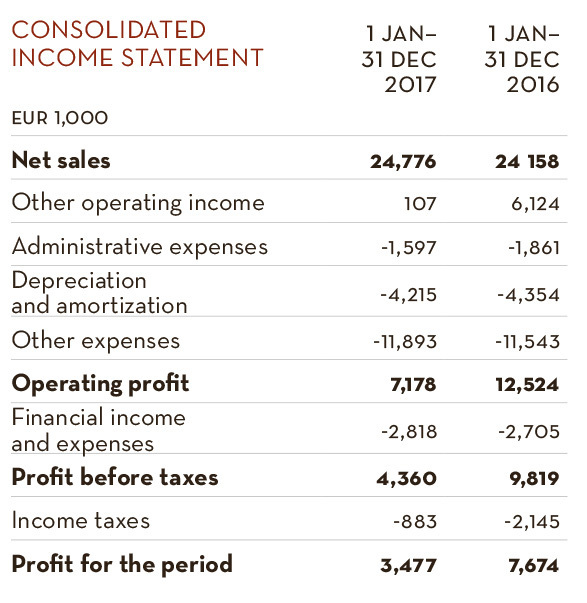 Operating profit was EUR 7.2 million. 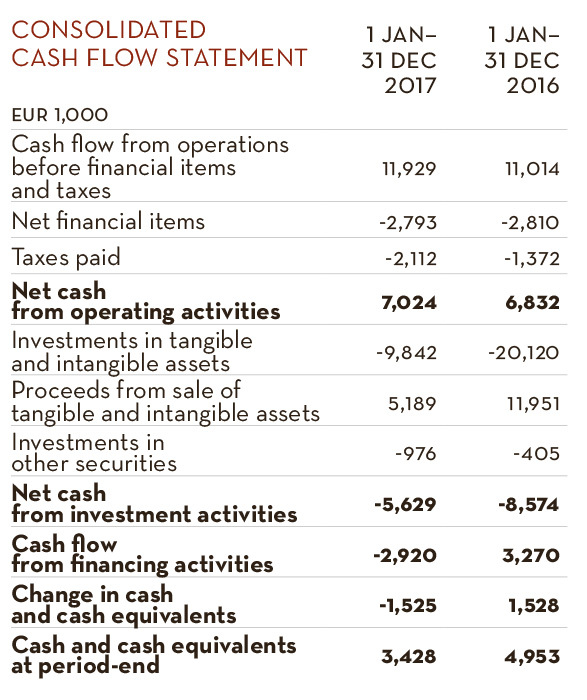 The profit for the financial year was EUR 3.5 million. 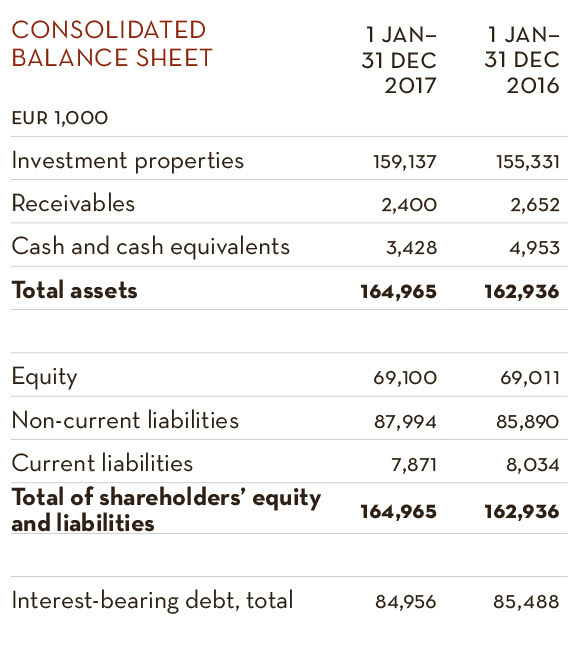 Property development was very active: investments in 2017 amounted to EUR 13.9 million. The most significant investments were made in the Askonalue in Lahti and in the Tikkurilan Silkki in Vantaa. As illuminated by our key performance indicators, Renor has proof of its success from previous years and of the opportunity to further strengthen its position as the most appreciated redevelopment company in the real estate sector. The indicators marked with * include the Puuvilla city block. Renor is owned through their companies by Heikki Hyppönen, Hannu Katajamäki, Ilpo Kokkila, Kari Kolu, Janne Larma, Niilo Pellonmaa and Jarmo Rytilahti.